The CORE…is involved in every movement we make. Think of the core as the central link that connects the upper body to the pelvis and the lower body to the pelvis. This is where all the action takes place. Weak core muscles impair how well your arms and legs work and lead to poor movement patterns which leads to injury and pain. A strong core helps stand us upright, helps us breathe deeply and more efficiently. A strong core helps move with confidence, power and grace. A strong core helps protect us from falls, sudden blows and helps protects our spine and back. No matter what we do our core plays a role. From sitting at our desk, to mopping the floor, playing with the dog, playing a round of golf, taking a walk, lifting weights….everything! We need a strong core. A weak core leads to nothing but problems… Number one on the list BACKACHE PAIN! Low back pain — a debilitating, sometimes excruciating problem affecting four out of five Americans at some point in their lives — may be prevented by exercises that promote well-balanced, resilient core muscles. When back pain strikes doctors often recommend strengthening the core. They also, prescribe medications. Skip the pain pills and use your muscles. I realize, when you are in pain you don’t think you can move. I have been there many many times myself. Now, I know Foundation Training!. FT will track you how to use your own musculature to get thru the spasm and maybe never have them again. I am not joking! Eventually, FOUNDATION TRAINING will be everywhere. It’s all over the place in California , Colorado and more places to the West…it’s even worse growing outside the US. FT is slowing making it’s way to the south. FOUNDATIONS TRAINING is the absolute best core training exercise on the planet. Remember…those muscles attach to bones and they all end up meeting at the pelvis. Learn to raise your ribcage with your breath. Learn to expand your ribcage with your muscles. Learn to strengthen your posterior muscles while they are in a lengthened state. Learn to stand up tall again, Just because we are aging a little bit doesn’t mean we have to be weak and humped over. If you have that little round hump developing in your mid back…learn Foundation Training! If you have poor posture learn Foundation Training! If your back and neck hurt all day while sitting at your desk learn Foundation Training! If you are sick and tired of hurting from muscular aches and pain Learn Foundation Training! 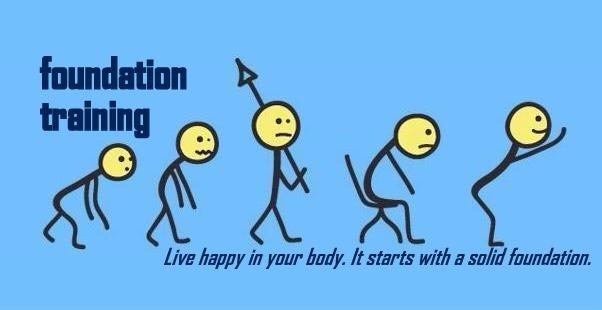 Start making changes…your body wants to feel better! It’s all up to you.